The secret to fresher food? Dedicating a few extra minutes to prepping and storing your groceries. 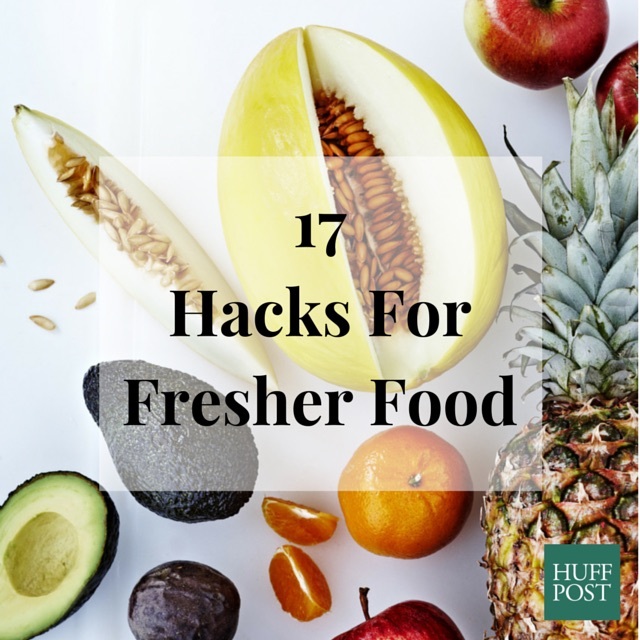 We partnered with Fresh & Easy, a new kind of market, to bring you 17 of the best hacks we’ve seen for keeping your favorite foods fresh. Put them to use and you’ll start mistaking your kitchen for your local farmer’s market. Minus that weird guy with the guitar. Avocados are creamy, delicious and nutritious but you don’t always need the entire thing at once. To keep your avocado halves green, refrigerate them in a container with a cut onion. Apples are the perfect healthy snack. Keep them from oxidizing by soaking slices in ginger ale for 10 minutes. How do you get your berries to last longer? It’s all about how you wash them. Try out this vinegar bath to keep your blackberries, strawberries and blueberries fresher than ever. Instead of refrigerating mushrooms in the plastic container they came in, store them in a brown paper bag to keep them firm and dry. You may be used to freezing vegetables and fruit to keep them fresh but did you know freezing basil, chives and rosemary works wonders too? Put herbs in an ice cube tray filled with olive oil or melted butter before freezing and you’ll be able to enjoy flavorful meals more often. Putting onions, garlic and shallots in punched paper bags keeps these flavorful veggies firm and fresh. A slice of bread keeps those irresistible cookies you bought from the store tasting freshly baked for days. Layer leaves with paper towels to enjoy crisp, seasonal salads all week long. Covered in aluminum foil, unwashed celery stays crisp and ready-to-use in soups, salads or as a snack for up to five weeks. Planning lunch for the busy week ahead? Storing prepared salads in mason jars keeps them fresh in your fridge for 4-5 days. When you first buy ginger root, peel and cut it into slices or chunks and place in the freezer...and then say hello to homemade ginger ale, ginger tea and carrot-ginger soup for many months to come. You might think the refrigerator is the last place to store nuts and seeds, but storing your almonds, walnuts and sunflower seeds in containers in a cool climate will actually keep them good--longer. Turns out the “apple a day” motto keeps your spuds in good health, too. Store potatoes with an apple to keep them fresh. Asparagus stays fresh uncooked for about three days but this super-easy trick using a glass jar, water and a plastic bag keeps your veggies crisp for a full week. Try this simple trick to see which eggs are old and which are ready for the frying pan. A cool way to keep lemons and limes for later use? Cut and freeze them in muffin pans so you can enjoy a tall glass of refreshing water all the time. Keep fruit and veggies fresh and clean with this DIY wash made of water, lemon juice and baking soda. For more kitchen hacks, visit Fresh & Easy's Pinterest page.